Graham Wynd is back with another fantastic collection. 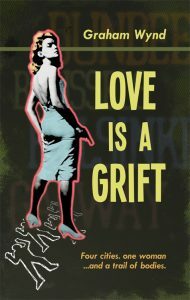 Love is a Grift. Cover by S.L. Johnson How does obsession begin? For one hit man it starts with a target he just can’t kill. She leads him on a deadly spree across Europe. With every step he’s in deeper. Each crime binds them together like a … Continue reading "Tales of Desperation – Love is a Grift Launch"